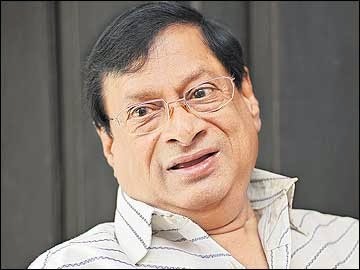 Telugu cinema’s noted comedian M S Narayana passed away at a private hospital in Hyderabad today on 23.1.2015 following multi-organ failure. He was 63. Narayana was diagnosed with malaria earlier this month, but he developed complications related to heart and other organs, hospital sources said. “We thought it was only malaria and it would be cured. We did not expect that he would be taken away from us like this,” Narayana’s daughter Sasikiran told reporters. “He was ‘ajatshatru’ (a person having no enemy). We thought he would overcome all this. But, he has gone to the God. The funeral would be performed tomorrow,” his son Vikram said. In a career spanning about three decades, Narayana acted in nearly 700 films and received several awards, including the prestigious Nandi award of undivided Andhra Pradesh government. Narayana, also an accomplished writer, was known for his rib-tickling comic roles and witty dialogues. He especially made a name for himself in portraying the roles of a drunkard. Narayana’s spoofs of top heroes like Rajinikanth, Balakrishna, young hero Ramcharan Tej from their famous films in Mahesh Babu’s block-buster ‘Dookudu’ made him a house-hold name. His other films like ‘Maa Nannaku Pelli’, ‘Sivamani’, ‘Chirutha’ also won him accolades. A number of top leaders and film personalities condoled the death of Narayana. Andhra Pradesh Chief Minister N Chandrababu Naidu said it’s an immeasurable loss for the Telugu film industry, as he recalled his “lively and funny chats” with the actor-director. Narayana had an illustrious career in acting, he said. “M S Narayana made us laugh hard and touched every element of human spirit. His relentless energy was thrilling,” he said. “His comic timing and expressions with witty dialogues made each one of us laugh hard every time we watched him on television or in the movies. His memories and his work will continue to entertain and stay with us,” the chief minister further said. Actor Siddharth said Narayana’s death was a terrible loss to Telugu industry. “MS Narayana guru was a learned man, a versatile actor and a very kind soul. Terrible loss for Telugu cinema and his millions of fans. RIP sir,” Siddharth tweeted.